Aiseesoft Audio Converter is an easy Audio File Converter software which enables you to convert all popular video/audio files, including 3GP, AVI, DV, Flash, MOD, MJPEG, MKV, MPEG, MPEG-4, MPV, QT, MOV, RM, RMVB, TOD, TS, TRP, TP, WMV, ASF, HD video and AAC, AIFF, CUE, FLAC, M4A, MP3, MP2, APE, OGG, AC3, RA, RAM, AU, WAV, WMA audio, to any audio(AAC, AC3, AIFF, AMR, AU, FLAC, M4A, MKA, MP2, MP3, OGG, WAV, WMA) format. Moreover, it will bring you much faster converting speed with AMD APP and NVIDIA CUDA technology, and it can also support 5.1 channel audio now. Besides of converting several videos or audios to one format, Aiseesoft Audio Converter also owns the ability to convert one file to several audio formats with only one conversion. Aiseesoft Audio Converter provides an easy way to combine and join multiple audio pieces together - just select audios you want to join and click the &quot;Merge&quot; button. This Audio Converter enables you to cut any clip from the original audio/video. You can set the &quot;Start Time&quot; and &quot;End Time&quot; of the clip or just drag the slide bar to the accurate position. You can set audio settings, including Audio Encoder, Sample Rate, Channels, and Audio Bitrate. All the settings can be saved in the option list of &quot;User-Defined&quot;. 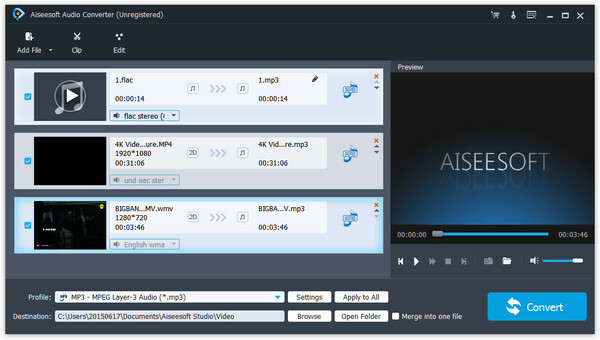 With Aiseesoft Audio Converter, you would own the ability to select audio track and subtitle for output files. With this Audio Converter, you could preview the source video/audio and edited video/audio, get your desired picture by taking the snapshot while previewing video, and save it as JPEG, GIF or BMP formats picture.